Visiting home, catching up with old friends, enjoying all kinds of delicious flavor—the holidays are the best. Making holiday fitness mistakes, though? Not the best. Actually, they’re kind of the worst and can absolutely ruin your holidays. Odds are, you’ve made one of the big three holiday fitness mistakes I’m about to explain. Most people do. Every. Single. Year. It’s time to put an end to the three biggest fitness mistakes I see people make year after year. But before I tell you what they are and exactly how to avoid them, allow me to explain something important. – I’m not here to tell you how many burpees you have to do in order to burn off your Thanksgiving dinner. – And I’m definitely not going to make you fear the weight you’re “doomed” to pack during the holidays. If that’s you’re looking for, please click the little X in your browser. This article isn’t for you. 1. People that want to enjoy the holidays. 2. Anybody who wants to simplify fitness during the hectic holiday season. 3. Everybody that wants to be more fit before the New Year. Expecting to gain much more than a pound is simply expecting too much. But this over-expectation doesn’t stop there. People expect too much of themselves as well. Anybody that’s expecting to hit the gym every day and crush their new diet over the holidays, needs to get real. Expect perfection and you may as well plan for failure. Cut yourself some slack and you’ll set yourself up for success. Recalibrate your expectations. Both how much weight you’re expecting to gain and how much you’re expecting from yourself during the hectic holiday season. During the holidays, it’s simple. Expect to maybe gain a pound or two—not seven. Expect to eat pie at parties. And expect to skip a few workouts for family gatherings. Because let’s be honest, all three are probably going to happen. And it’s totally okay. Overall, people don’t eat enough during the holidays. Sure, you may eat more than enough English toffee and See’s Chocolates. But we don’t eat enough real food—you know, protein, fruits, veggies. Just like Grandma used to say, sweets and treats will ruin an appetite. It happens to me all the time. A friend drops off a holiday gift full of goodies and I eat a bunch of the deliciousness. Because obviously. Before I know it, I’m sitting down to a proper meal and I’m completely stuffed. Ever been there before? I think we all have. Turns out, Grandma was onto something. When we fill up on foods that provide no nutritional value, we don’t have any room for the foods that do. What’s more, sweets and treats don’t satisfy. A few hours later, hunger comes rushing back. And if you reach for a snack devoid of nutrition, you’ll repeat the cycle. Eat more of the foods you know you should. A good place to start is with vegetables. Try eating a heaping helping of vegetables with every meal. (Shoot for a portion about the size of both your fists.) That’ll help you level up your nutrition. Immediately. But… You should still leave room for your favorite holiday treats. The goal isn’t to completely stop eating the foods you enjoy. That’s a fool’s errand and goes against what we talked about with the first mistake. Plus, a lot of people get carried away during the holidays and could even benefit in eating more of their favorite foods. For one, there’s the delicious euphoria that comes with eating something amazing. Also, indulging (without overindulging) has actually been shown to help get you better results. That’s why the best programs leave a little wiggle room. This year, eat more of the things you know you should. Then enjoy the things you know you love. Doing eleven billion burpees to burn off your Thanksgiving feast? Jogging long enough to offset the calories from Chanukah dinner? Doing enough crunches to erase those Christmas cookies? Ain’t nobody got time for that. Any of that. During the holidays, most people don’t have much time for, well, anything. Sure, “it’s the most wonderful time of the year.” But it’s also one of the busiest. And there are more important things to do than jog countless miles on the treadmill or log countless hours in the gym. In spite of that, people everywhere try to buckle down and do more fitnessy things. Ya know, to offset all the weight they (mistakenly) expect to gain. Don’t get me wrong; I’m not against exercise. But I am against people sacrificing things that truly matter during the holidays for extra time in the gym. Things like quality time with loved ones, serving those that are less fortunate, and ding-dong-ditching your neighbors. Extra gym time just isn’t necessary. Your holidays should be enjoyed. Spend less time exercising. Period. Odds are, you have less time to exercise during the hectic holidays anyway. There’s good news, though. Those odds are actually in your favor. Sometimes, spending less time exercising can help maximize results. This holds especially true when it comes to fat loss. One of the most important factors in exercise-induced adaptation (read: progress) is intensity. Increasing the intensity of your workouts allows you to spend less time exercising without sacrificing results. One simple way to increase your exercise intensity is to complete the exact same workout in less time. Shorten rest periods, start using circuits or supersets, or simply lift the weights faster. Increased intensity will force your body to adapt, which will lead to better results in less time. The holidays can be a tricky time of year for anyone trying to keep fit. But they don’t have to be. At this point, you’re well equipped to avoid the big holiday fitness mistakes this year. 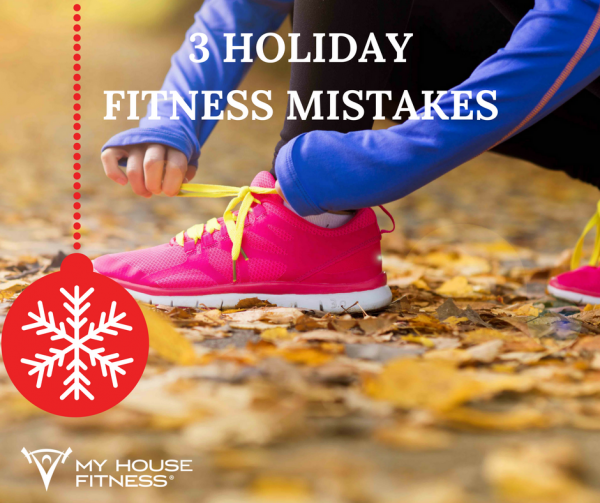 Avoid these common mistakes, and a fit holiday season suddenly becomes possible. But I want to do you one better. I don’t just want your fit holiday season to be possible, I want it to be easy.